Julia Isabel Martinez Rivera finds herself in the middle of a boxing ring in Lawrenceburg, Indiana, a national championship on the line, standing eye to eye with her opponent as she prepares for the defining six minutes of her boxing career. Well, not exactly eye to eye — pretty far from it actually. Martinez Rivera stands five feet flat, but her opponent stands five inches taller — the advantage in height also comes with an advantage in reach. Not only does Martinez Rivera’s opponent have the physical advantage, but she has the upper hand in experience. Her opponent earned a bronze medal the year prior, while Martinez Rivera could count the number of matches she fought on one hand. Martinez Rivera is new to the game, and she’s quickly become accustomed to playing the role of the underdog. Once again, she was pitted against a taller, lengthier and more experienced opponent. After three rounds, Martinez Rivera turned her ringmate into another defeated opponent. The foundation for Martinez Rivera’s boxing begins in Pampanga, a province in the Central Luzon region of the Philippines, where she lived before immigrating to Anaheim, California, in 2001 at the age of four. Long before she had a conceptualization of what it meant to fight in an organized fashion, she became familiar herself with combat. Martinez Rivera’s love for sports continued through elementary school, but her combative side from her childhood days was tucked away in favor of noncombat sports such as basketball, volleyball and softball. That was the case up until middle school. Martinez Rivera initially lived in Orange County and attended St. Anthony Claret Catholic School, a private school which stretches from preschool to the eighth grade. Upon moving to Riverside County, Martinez Rivera and her parents couldn’t find a suitable private school in the area. With no viable private school options, Martinez Rivera enrolled at Menifee Valley Middle School, a public school. From the perspective of a parent, the move from private to public school is no easy pill to swallow. St. Anthony Claret had fewer than 300 students total; Menifee Valley, on the other hand, had approximately 1,000 students. Martinez Rivera didn’t think much of the transition, but her parents were worried because of the reputation of public schools. To ease this transition, Martinez Rivera’s childhood combative side would once again be called upon. That defense mechanism was muay thai. While Martinez Rivera may have initially enrolled in muay thai for her parents’ sake, she would develop a passion for the arts and sign up for both jiujitsu and karate. With such a strong base established in her time competing in combat sports throughout middle school and high school, Martinez Rivera took on the challenge of adding another skill to her repertoire as a sophomore at Cal. That competitive nature was put to the test in the early days of her collegiate boxing career. After enduring a grueling, two-week tryout in February 2017, Martinez Rivera landed a spot on the noncompetitive team. Less than a month later, she was on the competitive team and in the ring. Muay thai, jiujitsu, karate and boxing all fall under the umbrella of martial arts, but each brings its own unique set of codes and conventions. “Muay thai is a stand-up game. That includes punching, kicking, striking with your elbows and knees. … Jiujitsu is a ground game. With that, you’re on the ground with your opponent. You’re trying to submit your opponent. That’s either through a choke or an arm bar — stuff like that. With karate, although it’s stand-up, it’s completely different,” Martinez Rivera says. Some of the elements of Martinez Rivera’s background were transferable to the boxing ring, but there were adjustments to be made and old habits to be kicked. Martinez Rivera was unquestionably raw as a boxer even with her extensive background, but she’d have to learn quickly, having been thrust into her first match less than a month after joining the club. The reason for such a quick turnaround was that she needed one fight under her belt if she wanted to qualify for regionals. Inexperience wasn’t the only external factor heading into her first fight. In addition to competing in the 119-pound weight class opposed to the 112-pound weight class — she did not want to shed too much weight in such a short amount of time — the atmosphere was quite the change. “In my past tournaments, there’d be a bunch of different matches going on at the same time, so it’s not like the entire crowd is just watching you,” Martinez Rivera says. To the casual bystander during that fight, however, it would be difficult to ascertain Martinez Rivera was nothing short of a seasoned veteran in the ring. She not only won her first match, she did so by way of a clean sweep, 3-0. That victory, despite it being the only fight of her career at the time, allowed Martinez Rivera to qualify for regionals. After a win at regionals, she would qualify for nationals in Lawrenceburg, but because she had only fought twice, she didn’t qualify for a bye and had to fight every round — three fights in three nights. Martinez Rivera breezed through the first two fights, defeating Penn State’s Erin O’Donnell-Zwaig and Naval Academy’s Sophie Lekas, 3-0. 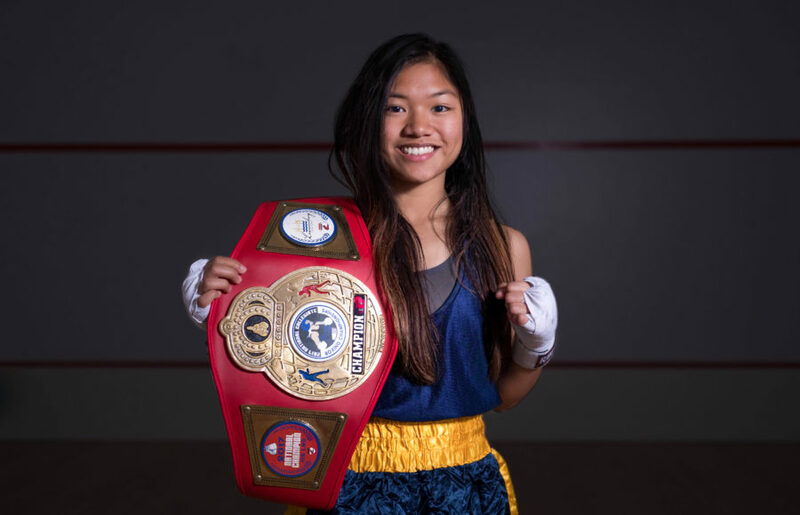 Those wins matched her up with Esther Nagila from Army — a program in the upper echelon of boxing schools — in the championship round. With her father in attendance and mother and siblings watching on a live stream, Martinez Rivera’s nerves were replaced with supreme confidence. That final fight called on her to unlock every aspect of every martial art: the combinations of muay thai, the quickness of karate, the awareness of jiu jitsu. At the end of the three rounds, Martinez Rivera emerged victorious by split decision, 3-2. “When my name was called, that was the first thing that came to my mind: that I made my family super proud,” Martinez Rivera says. For someone with only two months of training and four career fights to her name heading into that final bout, Martinez Rivera fought with the composure and poise of a fighter who has been lacing up her gloves for years. Having reached the pinnacle of collegiate boxing in such a short amount of time, there’s no telling where Martinez Rivera, now a junior, will go. The short-term goal is defending her title this year, but the long-term goal may just put her on one of the biggest stages the sport has to offer. In her next two seasons of eligibility at the collegiate level, Martinez Rivera will continue to battle opponents who are far more physically advantaged. But after racking up plenty of victories in a year and change with Cal boxing, Martinez Rivera has proven that her opponents, despite their size advantage, should sweat her technique. A previous version of the headline accompanying this article incorrectly misspelled Julia Isabel Martinez Rivera’s last name.